Mini melons are a popular specialty item, fetching a much higher price per pound than regular melons. Customers like them because they are easy to carry, take up little space in the refrigerator, and can be eaten in one sitting. 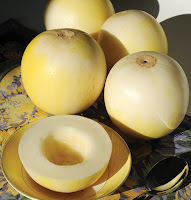 Using traditional breeding techniques, melon breeders have been developing new, smaller varieties to meet market demand. One of the best varieties to come from this effort is the mini honeydew melon 'Sprite'. 'Sprite' melons are about 4-5" across and weigh 1-1 1/2 lb. They are extremely sweet, with flesh often described as "almost as crisp as an apple." They have a thin white skin that develops a yellow blush when ripe, and they slip from the vine easily when ready. They have good disease resistance to powdery mildew and Fusarium wilt (Races 0, 1, & 2). 79 days to maturity. Available as treated seed only this season. Melons require soil temperatures of at least 70F, so growers in cool areas should consider starting them on IRT mulch and under Agribon row cover or Hotkaps, until the weather is settled. New gourds include 'Daisy' mix, a small gourd in several colors topped with flower-like patterns; and 'Gremlins', a diverse collection of small to medium-sized (5-7+"), warted gourds in vibrant colors and a multitude of shapes. We also have 'Lunch Lady' which is a collection of giant warted gourds that range from 5-20 lb., in various colors and shapes. Fall ornamentals are an increasingly important crop for many growers. 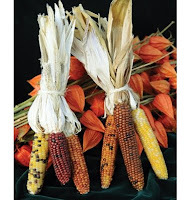 These new varieties are sure to set your offerings apart from the usual fall fare. Spice up your salad mixes with edible flowers this spring. 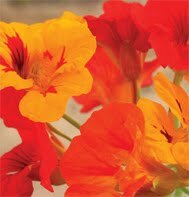 The hot colors of nasturtiums really light up a box of greens, and the foliage can add a zing of peppery flavor. Nasturtiums love the cool weather of spring and will continue to produce throughout summer. Johnny's has eight varieties from which to choose, including the new 'Kaleidoscope' organic mix for certified-organic growers. No, we're not talking about a federal program. We're talking about HotKaps and Agribon row cover, two inexpensive products that can save your season from ruin in the event of a late freeze, while getting your summer crops off to a great start. 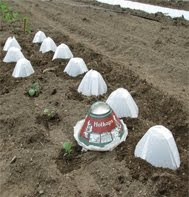 HotKaps are waxed-paper domes that are placed over individual plants to give them an early start and protect them from frost, like miniature hothouses. They have been used by commercial vegetable growers since the 1930s, and the product is the same now as then; it's even manufactured on the same machinery. Anything that has been in use for more than 60 years has got to be good. They provide a 2-4 week head start in the field, allowing plants to develop earlier and stronger. Regular size (6" tall x 11" diam.) are ideal for low-to-the ground, spreading plants, such as cucurbits like watermelons, cucumbers, and squash; king size (9" tall x 11" diam.) work best for more vertical plants like tomatoes, peppers and eggplants. Made from white opaque wax paper, they provide diffused lighting around the plant. Small slits are cut into the top by the user for ventilation. As the plant grows, slits are widened while still protecting the base of the plant. When the plants have grown too big for the HotKaps, you can throw them in the compost. Agribon row cover can also be used to give plants an early start and insure against late frosts. Agribon is available in a variety of sizes and weights for every application on your farm. The narrow widths can be used on hoops to make low tunnels that provide a warm, sheltered environment. A wide blanket of Agribon can be kept on hand and pulled over large areas when temperatures dip. With Hotkaps and row cover, you can be prepared for the fickle weather of early spring.